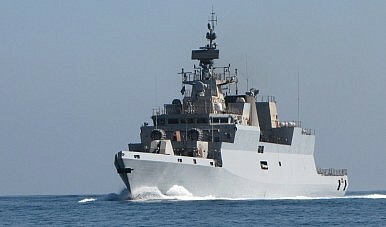 INS Kamorta, the lead vessel of the class, undergoing sea trials. The second out of four next-generation corvettes was commissioned on January 7. On January 7, the Indian Navy commissioned into service the second out of four planned Kamorta-class anti-submarine warfare (ASW) corvettes. The ceremony was presided over by the Indian Navy’s Chief of Naval Staff, Admiral RK Dhowan, at the Naval Dockyard in Visakhapatnam in the Indian State of Andhra Pradesh. According to Admiral Dhowan, the commissioning of the second Kamorta-class corvette, the INS Kadmatt (P 29), is another milestone in the self-reliance of Indian Navy. “[N]ow [the] Indian Navy is a builders navy, not buyers Navy,” he said during a speech, NDTV reports. The “commissioning of Kadmatt will add a new dimension to the ASW capability of Indian Navy and in particular, the Eastern Fleet. The multifarious missions that can be undertaken by the ship truly reflect the enhanced multi-dimensional capability of the Indian Navy,” he added. The Kamorta-class is powered by a combined diesel and diesel (CODAD) propulsion system integrating four 3,888kW main diesel engines, two controllable pitch propellers and noise-suppressing raft-mounted gearbox. The ship’s crew consists of around 190 officers and sailors, IHS Jane’s Navy International reports. The keel for the lead vessel of the Kamorta-class was laid down in November 2006. The INS Kamorta was launched in April 2010 and commissioned in August 2014. Work on the second corvette, INS Kadmatt, began in September 2007. The ship was launched in October 2011. The other two corvettes of the class are expected to be commissioned by the end of 2017. All the warships are being built by M/s Garden Reach Shipbuilders and Engineers Ltd (GRSE). The Kamorta-class corvettes’ primary mission will be anti-submarine warfare, but they can also be deployed in anti-surface warfare (AsuW) and anti-air warfare (AAW) missions. Consequently, the ships are equipped with a modern 16-cell vertical launching system (VLS) for firing Barak surface-to-air missiles and an OTO Melara 76 millimeter Super Rapid Gun Mount. The ASW-focused combat system includes four heavyweight torpedo tube launchers and a pair of 12-barreled RBU6000 rocket depth-charge launchers featuring several design improvements incorporated by Larsen & Toubro. It is not known if the locally developed Mareech anti-torpedo decoy system has been installed. The fire-control system is the Bharat Electronics IAC Mod C system. The ship is also equipped with a Humsa-NG bow-mounted sonar and will be fitted with an Atlas Elektronik towed array sonar system in due course. In addition, every Kamorta-class corvette can also accommodate one ASW helicopter.